Rewards are most effective when they are given without warning. For example rather than saying, "You will get to go outside when you finish your work." Try saying, "I love how hard you worked on that assignment, why don't you go out to recess early." You don't want to bribe students to do their work. Make sure that you are providing students with assignments that are meaningful and rewarding in themselves. By challenging students with purposeful assignments you avoid the dreaded question, "What do I get out of it?" Everyone likes to be appreciated for their hard work. Even teachers enjoy being rewarded and celebrated for their efforts. Why then should we expect our students' work to go unrecognized? When you give a reward, present it as appreciation for the behavior. For example, "I love how you showed patience helping another student with his work, would you like to be the assistant teacher for the rest of the week?" The use of intangible rewards is important because these rewards have been shown to increase student's intrinsic motivation. On the other hand, tangible rewards, such as my prize box, have been shown to decrease intrinsic motivation over time. Just as it is best practice to use logical consequences in the classroom, we should be using logical rewards as well. Rather than giving students candy for staying focused during a lesson give them the extra time that they saved as free time. What is your favorite way to reward students? 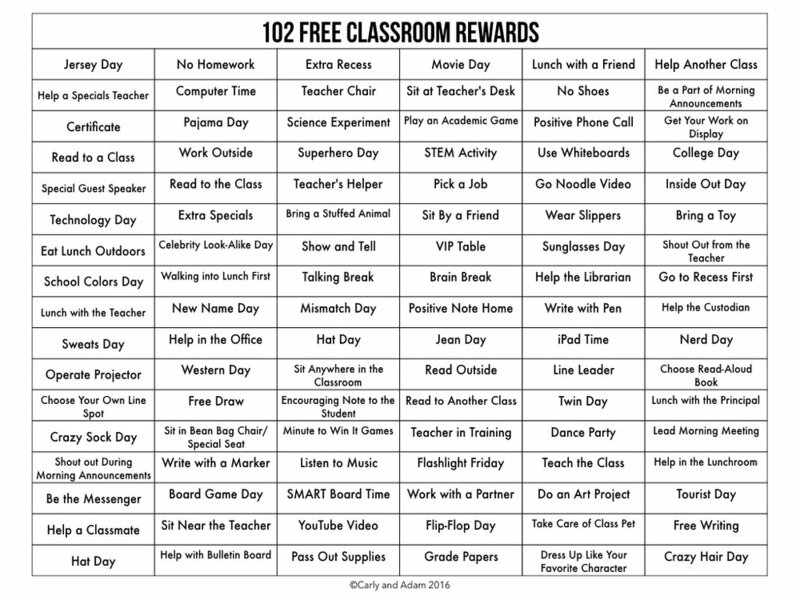 I have compiled a list of 102 free classroom rewards that you can download for FREE by clicking on the image. We would love to hear your thoughts. Please leave your feedback in the comments. We can't wait to connect with you!